Two hours into the project – good start. 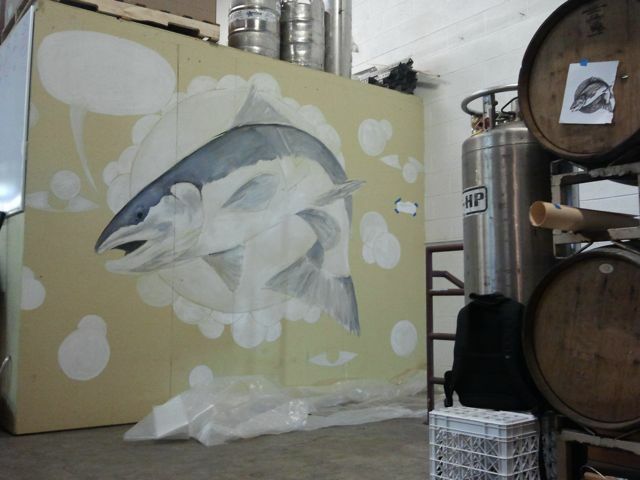 The mural is the first thing you see when entering the brewery. I’ve started a new mural, second in a series being done at local breweries, and also as an extension of my Winter Chrome series of drawings and paintings. When I finished Into The Maw at Pour Decisions Brewing Company last Fall, I immediately wanted to do another. I hadn’t done murals, and/or large scale paintings for quit some time, so Into The Maw was as much of an experiment and pursuit to reclaim some lost ability and honestly, confidence. Once found, I was hungry. I put the conquest of another mural aside to focus on exploring the subject of Winter Steelhead as a subject for a body of drawings and paintings. I started working through smaller works, then larger drawings, and eventually ran out of wall space in my basement studio. So, I needed a wall…why not rock a mural on a wall? I put the call out to friends on Facebook; if someone had a wall to spare, and wouldn’t mind me spending a few days painting a big steelhead on it, I’d be game. Payment and/or trade would be a plus. Jon Messier over at Lucid Brewing immediately hit me up on the social mediaz. Jon is a friend and colleague in the homebrewing and craft beer circles and he’s one of the owners of Lucid, along with Eric Bierman. He had some walls, he knew the Pour Decisions’ mural, and he was more than happy to let me loose. They’d keep me in cases of Foto (one of my local favorites) and I’d get to take some Winter Chrome to a larger stage.